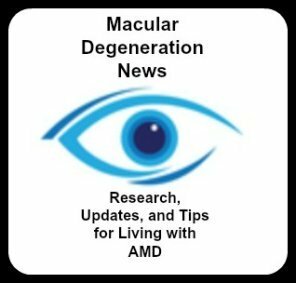 Looking for some low vision gift ideas for someone with macular degeneration? Get some ideas on gifts that can make someone's life a little easier. If you want some practical gift ideas for your friend or family member with macular degeneration, here are some ideas. A helpful hint in deciding on a gift idea is to think about an activity or hobby that your loved one or friend is struggling with. The gift could be something practical like a large number phone or something pretty like a magnifying glass necklace. As a person's macular degeneration progresses they will need more magnification and more light. They will also need different magnifiers for different tasks. Before you buy a magnifier for someone, think about what task they will be using it for. 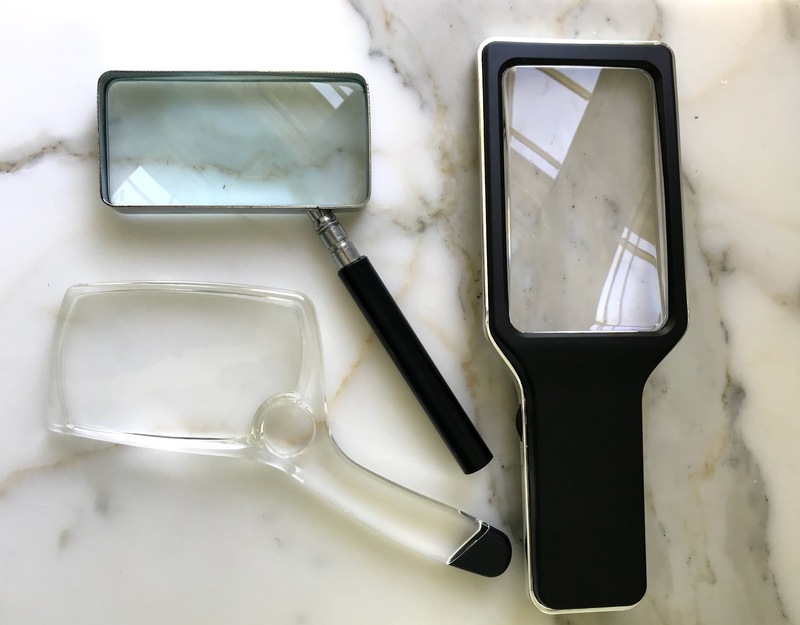 There is a magnifier for different needs whether it is for quick spot checking the ingredients on a box to a hands free magnifiers for hobbies. For someone who loves to read books or the daily newspaper, but is struggling with it due to macular degeneration, an electron book reader may just be the solution. 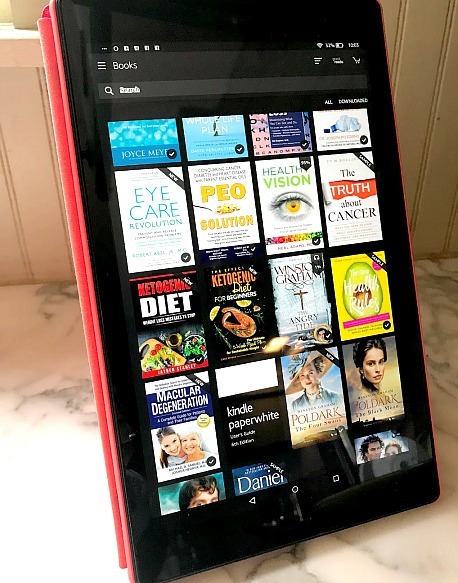 The availability of large print books is very limited, but with an ebook reader any book becomes a large print book, simply by pressing a button and increasing the font size. Enhanced contrast, adjustable fonts and spacing, and sharp, dark text provide better clarity for easier reading. Many people with AMD have been able to continue reading thanks to this new low vision technology. A magnifying glass necklace is an attractive and useful low vision magnifier for those with macular degeneration. It is light weight and attractive so you can wear it out shopping, to lunch or around the house. A necklace magnifier offers a practical way of keeping a magnifier with you at all times. It can be worn and used as a spot magnifier to read a price tag, a prescription bottle, a piece of mail, or a recipe. Put it on in the morning when you put in your earrings and wear it throughout the day. There is no need to search for your magnifier, because you always have it with you! Many necklace magnifiers only magnify 2x - but this one from Amazon magnifies 4X. It is attractive and useful at the same time. 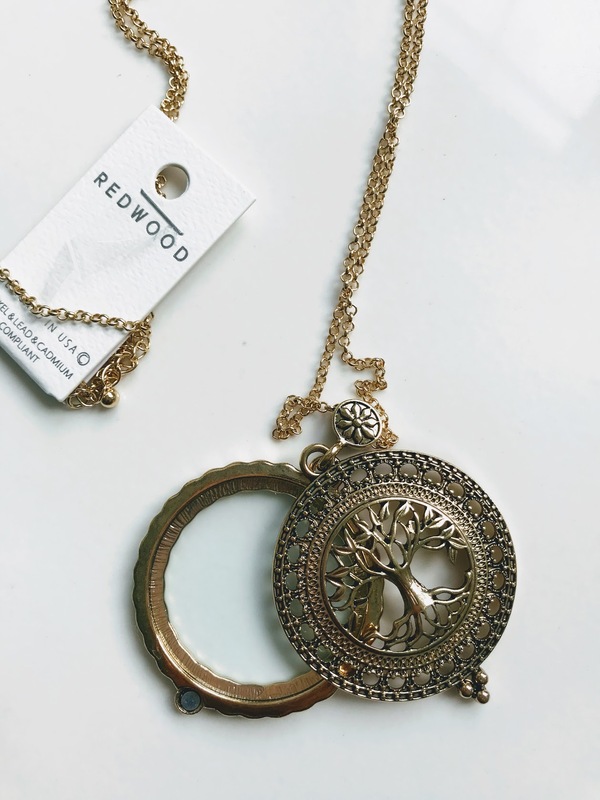 Tree of Life 4x Magnifying Glass Magnet Pendant Necklace, 30"
Having trouble seeing what time it is? Have you missed appointments or your favorite TV program because you have trouble keeping track of time? 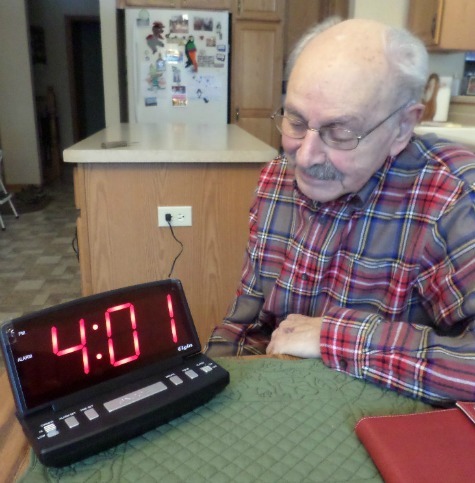 Invest in a low vision clock that has really large numbers that can be seen during the day or in the middle of the night. This large number clock can be seen during the day and at night. Not only does it tell you the time, but also the day and the date. 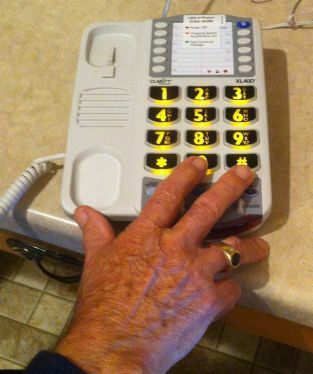 You will find extra large numbers and high contrast bold colored numbers on low vision phones - making them easy to see and use to stay in touch with friends and family. This is the one we purchased for my father-in-law who has wet macular degeneration and wears hearing aids. Large print playing cards, Scrabble or our favorite game of Sequence can be purchased in larger formats for those with vision loss. 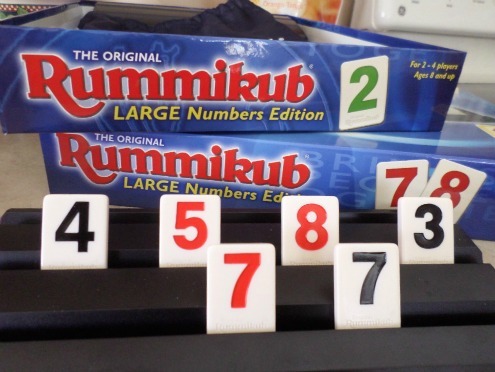 This year we are buying the large number Rummikub as a gift for my father-in-law who has macular degeneration. Don't underestimate the value of low vision games. Interacting with other people and challenging one's mind with games is an important strategy in adjusting to AMD and to aging. You do not need to stop playing games you enjoy like Bridge or Scrabble. Large print playing cards or large print Scrabble keep those with macular degeneration interacting socially and mentally. Keep playing your favorite games like Bridge or Uno ... or learn some new ones like Sequence. Playing games helps to keep you interacting with others as well as to keep your brain sharp. There are many other games available in large, bold print. Click here to see a selection of low vision games. Do you get frustrated when you can't make out what time it is? Or do you have to get out your glasses just to tell the time? Or maybe your macular degeneration has progressed so far that even with glasses you can't see the numbers. 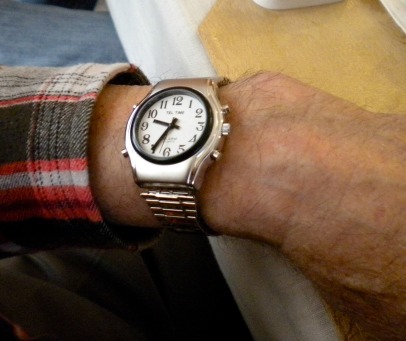 My father-in-law loves his new talking watch that also has big bold numbers. There are two different ways you can easily tell time when you can no longer see the numbers on your old watch. Get one with not only a larger face, but larger numbers and numbers that are bold and black on a crisp white background. Or if you prefer, simply press a button and listen to what time it is. 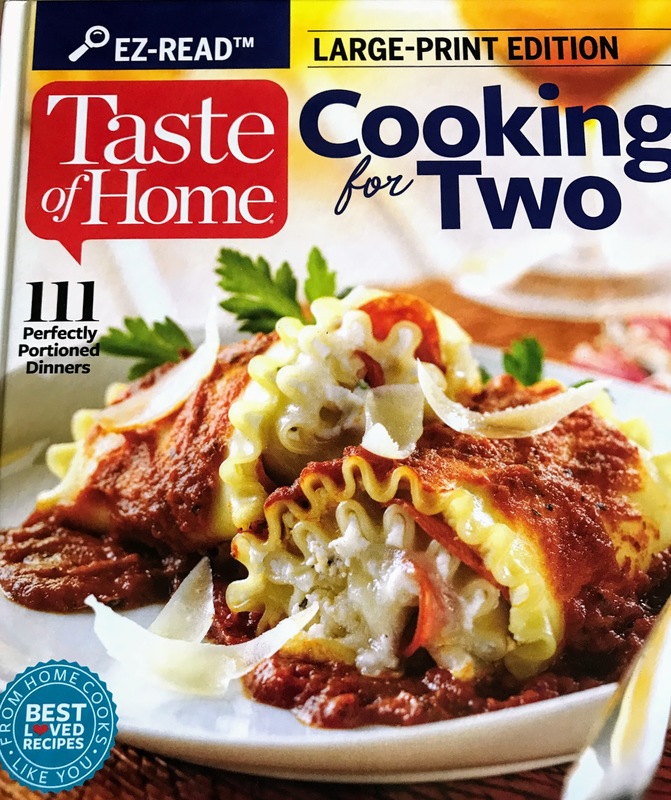 Either way, this is a simple way to tell time. A large number, talking wrist watch is a great solution. These watches feature a clear voice that announces the time when you push a button. A ladies talking watch comes in many stylish options and designs. By simply pressing a button on the watch a clear voice will tell you what the current time is. Large print books make a great gift. You can find large print books in every genre from mystery, to classics to daily devotionals. Not only are the letters larger, these books have bold black letters for better contrast and pages that don't have any glare. 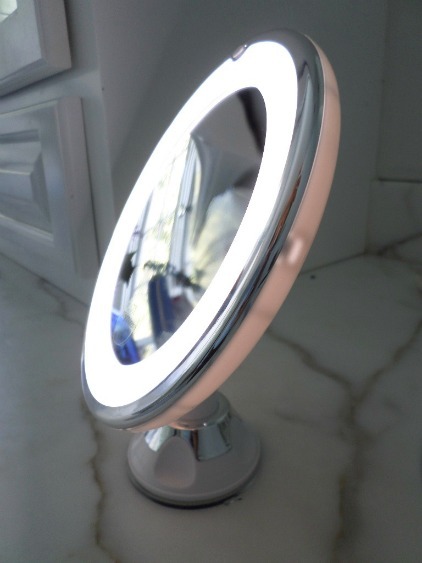 Lighted magnifying mirrors are a useful gift to help with daily grooming - whether it's getting your hair just right, shaving or putting on makeup. 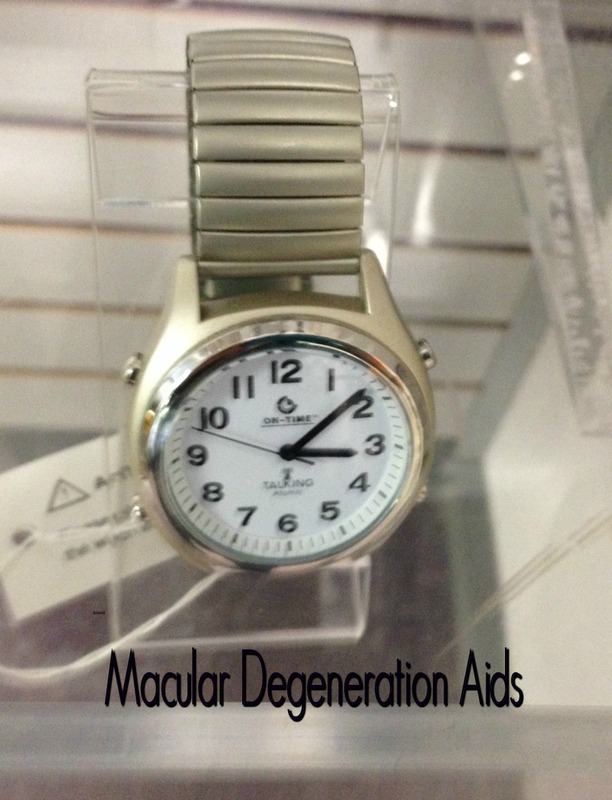 The combination of light and magnification makes it a great visual aid for those with macular degeneration. Large print keyboards and keys with stark contrast are easier to see and use for those with macular degeneration. The computer is such a great visual aid, but the small print letters on the keyboard can make using it frustrating to use. Consider giving the gift of an audiobook. Reading becomes more challenging as macular degeneration progresses. Listening to a book in your favorite chair with your feet up can be a relaxing way to spend your free time. Discount audiobooks are available in the form of books on CD or audio books on line that you download onto a Kindle reader, laptop, iPod or other electronic device. Listening to a book is a nice break from reading if you struggle with vision loss from macular degeneration (or even if you don't have vision problems). Today's technology can offer a wide range of easy and portable devices to listen to books at home, outside or when you are traveling. It's easier than ever to find an interesting book to listen to thanks to WiFi and wireless technology. I joined the Audible program at Amazon because it offered two free audio books. It's a great way to test the waters to see if this program is good for you. The advantage of paying for your audio books is that they are read by professional readers - meaning that the quality is much better than a computer generated voice or a volunteer reader. Even before I joined Audible I was able to download a sample of the book, The Help, before I decided on getting the audio version of it. 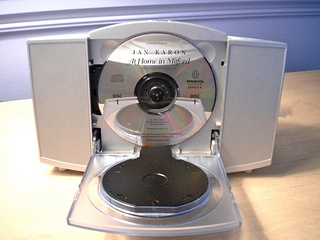 Enjoy your favorite read by listening to your books on CD's. Whether your loved one likes mysteries, the classics or biographies there is a book on CD that is sure to keep them interested.